When I first heard the Orange and Lemons’ songJust Like a Splendid Love Song on Jam 88.3 sometime during my early years in College, I thought it was song from a British group. I immediately fell in love with it and I thought of searching the group online and digging their other music. I was surprised to learn that the song was already two years old and it was from the Filipino group Orange and Lemons which was then rapidly climbing the steps of mainstream popularity with their infectious hit Hanggang Kailan dominating the airwaves. And just like any other music lovers during the so-called Golden Age of OPM after the nineties, I immediately became a fan of the group. They continue to release other hits such as Heaven Knows (This Angel has Flown), Lihim, Pinoy Ako, and Blue Moon which was used as the soundtrack of the movie of the same title. But all things, even the good ones, must come to an end. Shortly after the release of their third album Moonlane Gardens (which, in my opinion, the best Orange and Lemons album among the three), the group disbanded and formed other bands. Mcoy Fundales and the Del Mundo brothers formedKenyo while Clementine Castro formed The Camerawalls with the original OnL bassist Law Santiago. I have always idolized Clementine since the Orange and Lemons days, especially on the album Moonlane Gardens where he penned most of the songs. He’s a musical prodigy and he’s got good taste on music. Actually, music-wise, he influenced me more than any other musicians. I owe my love for Indie and British Pop to him. I tried to give the other three OnL members a chance on my eardrums but they have failed me on their Radiosurfing and Maharlika albums. Those albums, in my opinion, are no match against The Camerawalls’ Pocket Guide to the Otherworld and Bread and Circuses. Last night, while waiting for Kara David’s i-Witness documentary, I stumbled upon Clementine’s Facebook post (A link of his blog, Musings of a Commoner) about the original recording of one of the famous OnL hits, Blue Moon. Alongside with an excerpt of the song, he wrote a brief description of the song and how the client (the film outfit) removed him from the vocals and preferred the version that we know today. Most of us have heard the Mcoy Fundales-voiced Blue Moon and his version was good, catchy, dance-able, and the typical Orange and Lemons style that the general public loved. But as much as I respect Mcoy as a musician, I find Clementine’s version better. Though I am a big fan of the combination of Mcoy and Clem (they got one of the perfect vocal blending among the local bands), I find the latter’s voice more soothing, subtle, and good for my ears. (If you have heard the Clementine-voiced OnL songs such as Armageddon is Coming to Town, Pabango ng ‘yong Mata, Hey Please, and Let Me, then you know what I mean.) It has also a catchy Beatle-ish beat which was lacking on the popular version. I hate doing comparisons among artists but I choose which music is more suitable to my ear and my taste. And Clementine obviously has got it. After hearing the version above, which do you prefer? the popular version or this one? You may choose what you want but the bottom line is, let us keep the music alive. Let us keep the OPM flame burning. Support our local artists. A great artist may only appear once in a blue moon. But just like looking at the blue moon, listening to their works will be worth the wait. Padayon! Photo Courtesy of Clementine Castro’s Facebook page. As I grow up and as I learn more in the Seminary, my perspective has changed. And I should, because Seminary is a place of formation – spiritually, academically, socially, and formation as a mature, young man with the direction to the Priesthood. And even after I left the institution last March 2009 after graduating in Philosophy, even now that I am living in the real world away from the comforts of her confines, I continuously live (and share) most, if not all, the things that I have learned inside. There are no clear indications yet if I would return and pursue my Theological studies but the important thing is, I should and I must strive not to forget those good things. Last night, I planned to attend the Ash Wednesday Mass at our Parish (outside the UPLB Campus). 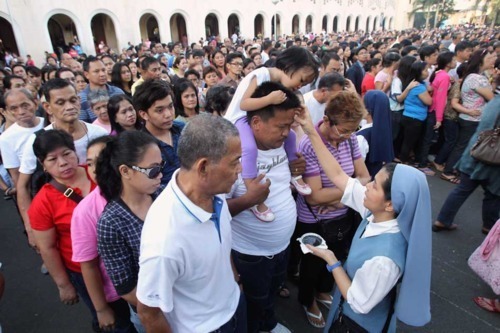 But when my mother told me that there will be a mass in their office (which is inside the campus), I decided to go there since it would be more convenient for me. The Mass celebrant is Father Thor (Yes, Thor. He may not look like Chris Hemsworth but he is one of the nicest, and funniest priests that I know), the Parish Priest of Saint Therese of the Child Jesus Parish (the church inside UPLB). And I did not regret attending his mass. His homily moved me. So what is the challenge for us? Father told us that when the Priest (or the Minister) put ashes on our foreheads, this is a invitation for us to ‘return to the earth’. It is an invitation for us to be stoop down from our level, be ‘dirty’, and to be humble. After all, humility came from the Latin word humus which means earth or soil. But I have learned my lesson today. Though I cannot say that I am totally doing it, I chose to listen and digest what Father has given us. I have learned that yes, we know things and sometimes, it is our expertise, but we should always be reminded. And we should see things from other people’s perspective. Today is the beginning of the Lenten Season. Let us spread the #AshTag.Vaya con Dios! It’s prom season once again. They say that this is the most anticipated event in one’s high school life. A night of fun, glamour, good memories, and an unforgettable moment for teenage first love. This is not a story for me to tell. I never had a chance to attend a Junior-Senior Promenade. I studied in an exclusive school for boys in High School. And during my senior year, when we cross-enrolled at a nearby coed Catholic school, I was not able to attend the graduation ball (the nuns replaced the JS Prom with it for some reasons) because I was busy preparing for college then (nuks). Last Friday was a busy day for the parloristas here in Los Baños. Almost all high schools inside the UPLB Campus were having their JS Prom. And for my younger sister who is a junior in high school, that night was surely a memorable one. She’s the family’s unica hija and the first among the siblings who will attend the JS Prom (My brother and I studied at the same high school.). So you can imagine how my parents, especially my Nanay, prepare for this once-in-a-lifetime event. Days before the Prom, I ask her if she has already a date/partner for that night. She said yes but she won’t give us his name. My Nanay, with her awesome cyber esponage skills, managed to look for the guy and we found out that he’s nice. I jokingly told my sister that I’m gonna bring my zombie apocalypse kit on the night of her Prom just in case the guy mess up. My sister was fetched in our house and went to the Prom with her barkada (not her date. Good for the guy, haha!). We basically let her do what she wanted on that special day. 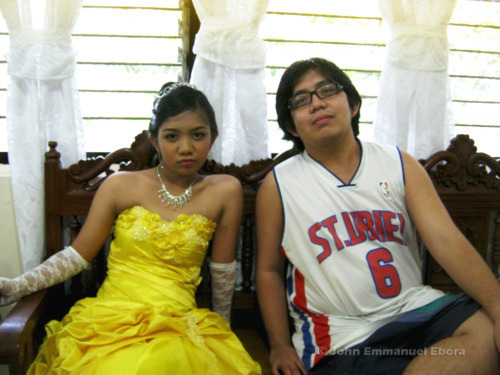 She went to the Prom while my Parents and I went to the muddy UPLB Feb Fair. They say that high school is the happiest stage of one’s life (though there are some who would beg to differ). Even Sharon Cuneta immortalized the tears and laughter of high school with the song High School Life. This is the stage of one’s formation, transformation, and self-discovery. I may have not experienced Prom but let me share with you some of my a priori thoughts on it. Enjoy every single moment of it. It only happens once or twice in one’s life time. It is also training ground for a bigger world after school. It is where you learn etiquette, decorum, and where you test your self-esteem ad self-confidence (by asking someone to be her date and not being a wallflower during the dance). I know that there are more knowledgeable and credible persons out there to talk about this but what I only have here is a small story and a good music to share. When I first heard this song by Sugarfree (with the Manila Syphony Orchestra), I was instantly amused by the David Pomeranz-penned King and Queen of Hearts introduction (a classic Prom song) before hitting the first drum beats and notes of one of the group’s famous anthems. How was your prom? Is it nostalgic or a horror? And for the younglings reading my blog, are you excited to have one? I hope this song by Sugarfree help you reminisce on this cold, rainy weather. Maraming salamat Ebe Dancel, Sugarfree, at Manila Symphony Orchestra sa napakahusay na awiting ito. Photo Above: My sister and I minutes before she went to the Prom. And please excuse my ‘beer barrel belly’. Thank you very much. 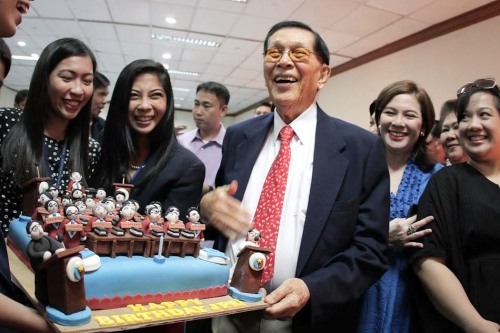 Manong Johnny Enrile’s 88th birthday. Yes, eighty-eight. Double infinity as some would say. Back when I was a young little kid, I see to it that I always watch the evening news with my parents/ grandparents. Through that, I became familiar with current events and the different personalities from politics, sports, and entertainment. I may have not memorized all of the politician’s names but there is always one who I always remember – Enrile. Juan Ponce Enrile. As I grow older and into maturity (hopefully), I indulged myself more in the matters of history, politics, society, government, and current events. And I can still hear Manong Johny Enrile’s name every now and then. He is always there. Or should I say, he must be always there. Time passed by and as we both grow older – me in my late teenage years and he, in his seemingly emergence into immortality – I got to know him more by reading history and news stuff related to his life. And he became one of my favorite law makers. Perhaps he is best known to this generation as the Senator who wishes us to be happy. His “Gusto Ko Happy Ka” (I want you to be happy) campaign slogan in the 2010 elections made him won the hearts of the youth and the generation who were not yet born during the dark ages of our history – where he also played an important role. Juan Ponce Enrile has seen, in 88 full years, the highs and lows, the tragedies and triumphs, countless political seasons, of the country. He not only lived through most of them, but also at every turn played a key role. The remarkable journey made his birthday, at the helm of a historic trial, so much more pregnant with meaning. Having been born in on the day of hearts, it seemed fitting he remained, eight decades after, still very much at home in the heart of history. Eighty-eight years. For some, it is the age of retirement. A time to spend your last remaining years on this planet with your loved ones. And a bonus age for most of us. but Manong Johnny Enrile just keeps on going and it looks like he has no plan to stop as long as he is able to do his duty. He is the perfect example of the Filipino saying about being hrdworking, ‘Kalabaw lang ang tumatanda’. Eighty-eight years. One is considered an immortal if his works and legacy continue to inspire and move others even after his death. But Manong is still alive and is continuously doing things for the future of this country. Eighty-eight years. Just like his birthday wish, I wish him stamina to perform his duties well. Will he live until the 2016 elections and be our next leader? What’s wrong with a 92-year old leader? Isa kang alamat Manong Johnny. Maligayang ika-walumpu’t walong kaarawan! At sa puntong ito, gusto ko, happy ka! “I Sense a Disturbance in The Force” – I always remember Manong Johnny whenever I see this villain from Star Wars. Seriously. It was the nineties. Some would say that it is the best decade for music, movie, recreation, fun, and entertainment. For those who were born and who grew up in that era, it wil be remembered for its good old memories of nostalgia and fun (but of course, those who were born on a different era will beg to differ). Nineties. It was the year when kasamabahay(s) are stereotyped by popular TV shows and movies with the name Inday and having an affair with asikyu (security guard). And it was also the year when a song for every Inday – and every romantics – came out. It was I Will Always Love You. Or for every pun-loving Filipino in that decade, it was Inday will always love you. The song was so popular in the country that it became an anthem of almost every music-loving Filipino (long before Celine Dion’s My Heart Will Go On, but that’s another story). 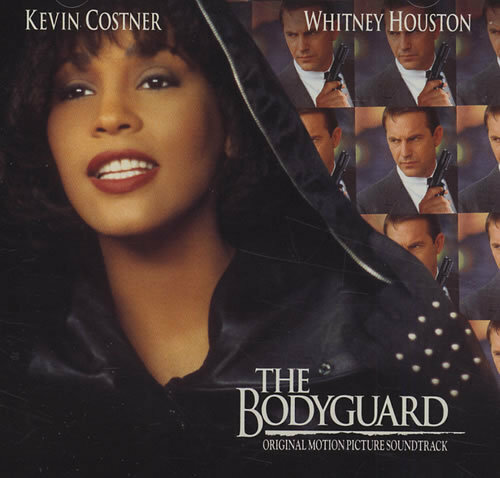 Though not a Whitney Houston original (it was Dolly Parton who sang the original), the song gained popularity after the former recorded it for the soundtrack of her debut movie, The Bodyguard. Ah, that movie. It is considered one of the classic romantic-thriller movie of that age. I remember watching it in my grandparents’ house on their trusty VHS player. I did not care about the movie being a romantic flick then. What I care about is it being an action-thriller movie. And its theme song I will Always Love You. And just like any other kid, or a typical Pinoy, who sing that song, I used to sing it as “Indaaa-hiyaay! Will always love you! Huuwaaa..”. What made me sing a Whitney Houston song for cryin’ out loud? Perhaps it’s because of the song’s popularity during that time that it became the anthem of almost everyone. It became the song that everyone knew to sing and to love (unlike Frank Sinatra’s My Way that became infamous for it’s, uhm, fatal effects). Just like a young child singing whatever is overplayed on television and the radio, perhaps I just joined the Whitney Houston bandwagon then? I woke up last Sunday morning, February 12 here in the Philippines, learning about Whitney Houston’s death via Tumblr and Twitter. And I told myself that’s it, another musical legend passed away, leaving her fans, listeners, and people whom she inspired in grief. The news about her drug addiction during the last years of her life may always be included in her story but that would not suffice to overshadow her fame, success, and legacy. You may call yourself a die-hard fan who would weep because of her sudden demise. You maybe just an ordinary music fan who appreciate her music. and you may be just someone who recently listen to her music and joined the We-love-you-Whitney-Houston bandwagon. But I will always remember her as someone who introduced me to Inday andThe Bodyguard. Someone who helped me discover my love for singing and music. Goodbye Whitney. Thanks you for the music. Millie grazie! Noong isang araw, nabulabog ang mga angry birds ng cyber space nang sa kauna-unahang pagkakataon ay tumayo ang kilalang miyembro ng Senate Committee on Silence na si Senator Lito Lapid at nagsalita sa impeachment court. At dahil bihira ang pagkakataong iyon, nag-trending worldwide ang Senador sa Twitter. Kasama ang pangalang Leon Guerrero. E sino nga ba si Leon Guerrero? Siya ang Pinoy version ng Lone Ranger na nakilala sa pinilakang tabing dahil sa pagganap ni Lito Lapid (pero mas naunang gumanap ang kaniyang tiyuhin na si Jess Lapid). Ang pinakanatatandaan ko sa kanya ay kung paano niya pinatay ang dalawang tumatakbong kalaban gamit ang iisang bala – sa pamamagitan nang pagpapaputok ng baril sa harap ng isang punyal (na kahit si MacGyver, hindi maiisip yun). Isa sa mga pamatay na movie posters noong dekada nobenta. Noong isang araw, habang naghahanap ng matinong palabas sa TV, ay napadaan ako sa Kapuso Movie Festival ng GMA-7 kung saan may nakita akong isang pamilyar na mukha na kasama nang noo’y payat pang si Beethoven Del Valle-Bunagan (Michael V.) – si Jeric Raval. Ang pamagat ng pelikula? Biboy Banal: Pagganti ko..Tapos Kayo (halimaw sa title!) na orihinal na ipinalabas noog taong 1994. At sa puntong iyon, bumalik sa aking alaala yung kabataan ko na tuwang-tuwang nanonood ng mga Pinoy action movies sa TV, VHS at sa Pinoy Blockbusters (Tatay ng Cinema One). 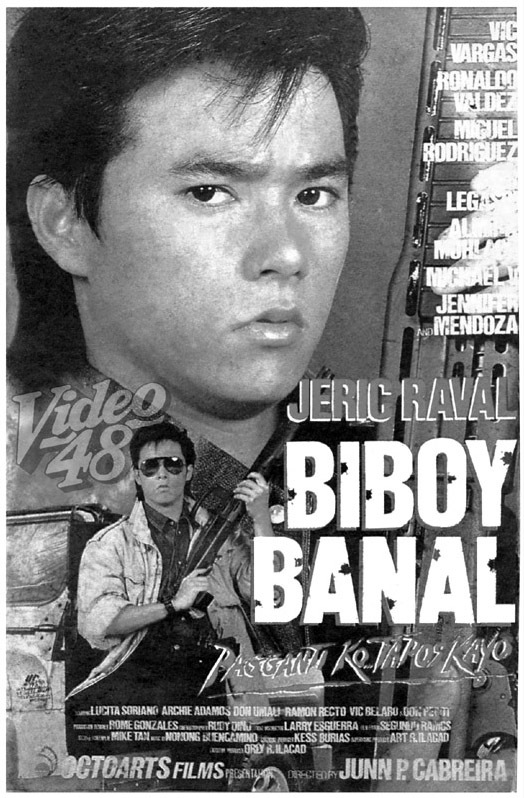 At isa nga sa mga naging paborito kong bida higit sa ibang action stars ng henerasyong iyon ay si Jeric Raval. Sino nga ba si Jeric Raval? Ang tunay niyang pangalan ay Jericho Buensuceso at inilarawan siya ng Wikipedia (ang hindi nagsisinungaling na bible ng henerasyon ngayon) bilang isang artista na nakilala sa kanyang leather jacket, leather pants, at shiny hair. 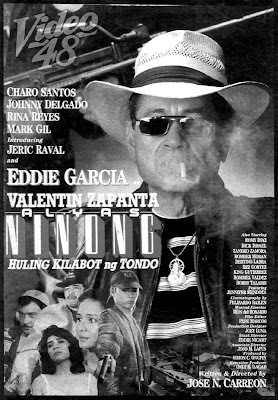 Una siyang nakilala sa pelikula ni Manoy Eddie Garcia na Valentin Zapanta Alyas Ninong: Ang Huling Kilabot ng Tondo kung saan gumanap siya bilang isa sa mga bata ni Ninong at ang kanyang kauna-unahang pelikula in a lead role ay ang Kalabang Mortal ni Baby Ama kasama sina John Regala at Willie Revillame (Oo, si Kuya Wil). Matapos noon ay naging sunod-sunod pa ang pelikula niya sa OctoArts Films katulad ng Boboy Salonga: Batang Tondo,Estribo Gang: The Jinggoy Sese Story, Beloy Montemayor: Tirador ng Cebu,Victor Meneses: Dugong Kriminal, Barkada Walang Atrasan, at ang personal kong paborito dahil sobrang pamatay ng pamagat na Bunso: Isinilang Kang Palaban. Napilitan si Jeric na tumigil sa paggawa ng pelikula matapos makatanggap ng Temporary Restraining Order matapos ang hindi pagkakaunawaan sa OctoArts Flms na nauwi sa korte. Matapos maayos ang gusot ay nagbalik pelikula si Jeric pero hindi na gaanong naging maningning ang kaniyang kasikatan. Ang kaniyang pinakahuling pelikula ay ang Lapu-Lapu ni Lito Lapid noong 2002 (na sa tingin ko ay kakaunti lamang sa inyo ang nakapanood). Para sa akin, may ibang klase ng karisma si Jeric Raval. Hindi siya yung tipikal na action star noong dekada nobenta na sa unang tingin mo pa lang ay alam mo nang mambabasag ng bote ng San Miguel beer sa ulo ni Bomber Moran o kaya ay makikipaghilahan ng bigote sa magkapatid na Rommy at Paquito Diaz. Siya yung klase ng astig na action star na hindi mo aakalaing makikipagpatayan sa mga bata ng kurap na Congressman, pulis, at negosyante. Maamo ang mukha kaya may elemento ng surpresa at gulat kapag nakikipagbakbakan sa loob ng bandonadong gusali o warehouse. Katulad na lamang noong pelikulang Biboy Banal: Pagganti ko..Tapos Kayo.Sa unang tingin, lalo na at kasama pa ang henyong si Michael V., ay aakalain mong isa na namang pelikulang comedy ng OctoArts ang palabas. Pero matapos na mapatay na ang kaniyang ama, gahasain at patayin ang kanyang kapatid , magkaroon ng nakakakilig na eksena kasama ang leading lady, ang kaunting pag-aaway sa loob ng beer house, at ang paglabas ng Mitsubishi L-300 na siyang sikat na sasakyan sa mga Pinoy action movies (samakatuwid, kapag lumabas na lahat ng cliche sa mga action films noong dekada nobenta), ay lalabas na ang kaniyang husay sa pag-arte bilang isang dekalibreng action star. Pero lumilipas ang panahon. Namatay ang action genre sa pelikulang Noypi at kasamang namatay nito ay ang karera ng daan-daang movie crew, stuntmen, kontra bida, at mga action stars na hayun, huli kong nakita sa TV ay nasa drama o sa mga pa-cute na youth-oriented shows. Nasaan na nga ba si Jeric Raval ngayon? Wala akong balita. Huli ko siyang nakita noong isang taon sa radio show ni Cristy Fermin sa Aksyon TV 41 kung saan sinabi niyang sabik na siyang magbalik-pelikula. At ganoon pa rin ang mukha, halos hindi tumanda. 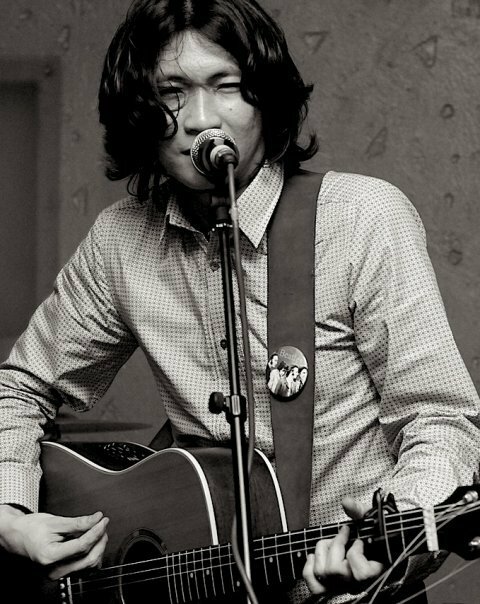 Parang si Ely Buendia. At ang namayapang si Francis Magalona. Sinasabing kinakailangang magkaroon ng ‘kamatayan’ ng action films sa Pilipinas para magkaroon ng ‘muling pagkabuhay’ at para maitaas ang kalidad nito. Sa pagpapalabas ng Manila Kingpin: The Asiong Salonga Story ni George Estregan at sa nalalapit na pagpapalabas ng Hitman ni Cesar Montano, masasabi nating unti-unti na ngang nabubuhay ang action genre ng pelikulang Pilipino. Utang na loob, sawang-sawa na ako sa paulit-ulit na comedy at love story sa pinilakang tabing. Ibalik natin ang Pinoy action Films. At ang titillating movies ng Seiko Films. Biro lamang ang huli pero puwedeng seryosohin. Hindi ako dalubhasa sa pelikula at ekonomiya pero sa tingin ko, ang magpapabuhay sa naghihingalong industriya ng pelikulang Pilipino ay ang masa. Gumawa tayo ng pelikula na hindi mang-iinsulto sa ating kakayahang mag-isip (katulad noong mga staple movies sa MMFF). Gumawa tayo ng de kalidad na pelikula na ikatutuwa at ipagmamalaki ng mga manonood. Gumawa tayo ng de kalidad na pelikula. Gumawa tayo ng de kalidad na action films – na sa aking opinyon ay ang genre na malapit sa puso ng masa. Nalalapit na ang muling pagkabuhay ng Pinoy action movies. At iisa lang naman ang hinihiling ko – ang makita ko ulit na nakikipagbarilan at nakikipagbasagan ng bote ang idolo kong si Jeric Raval sa pinilakang tabing. Isa kang alamat, Jeric Raval. Mabuhay ang pelikulang Pilipino! Respeto. Video 48 – Ang mga larawan sa itaas ay dito ko kinuha. Ang blog na ito ay patungkol sa mga classic Pinoy movies. Asteeg! How the metrosexual killed the action star – Kung dati, ang mga iniidolo ay ang mga lalaking may bigote sa action movies, ngayon, mga lalaking kung mag-ayos ay mas komplikado pa sa mga babae. Guns, Goons, and Gore – Lourd de Veyra’s take on the Pinoy action movies.